The Devils River is an awesome place to fish. When you have a crystal clear river in the middle of a desert, it is quite easy to say your are in an oasis. 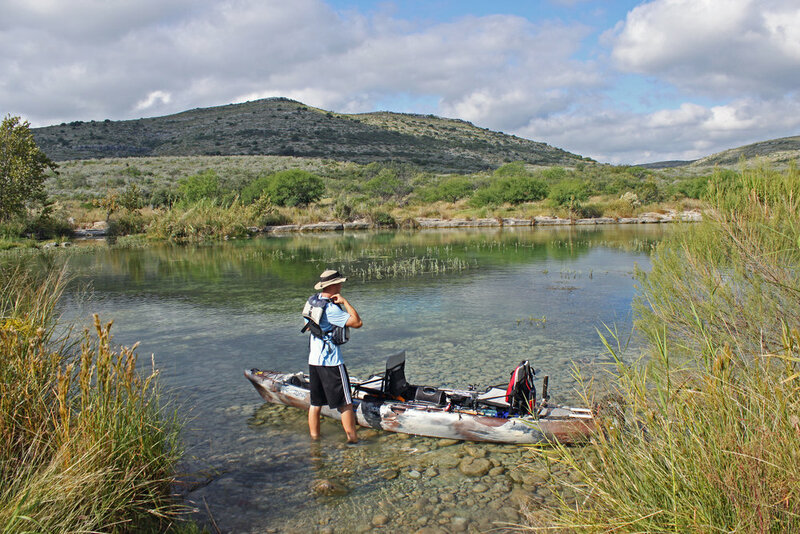 Kayak fishing the Devils River makes it that much more exciting. 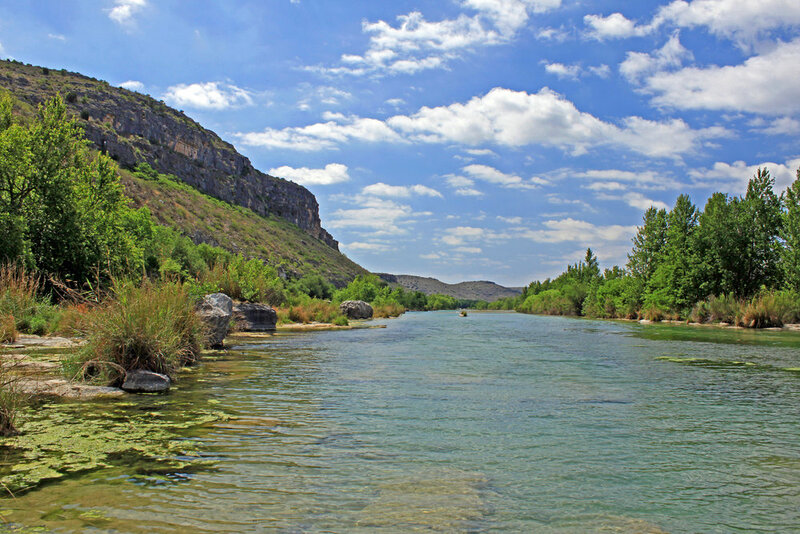 The Devils River is located in an extremely remote and somewhat dangerous area of Texas. Although the Devils River runs approximately 94 miles, the amount of put ins and take outs is extremely limited and primitive at that. 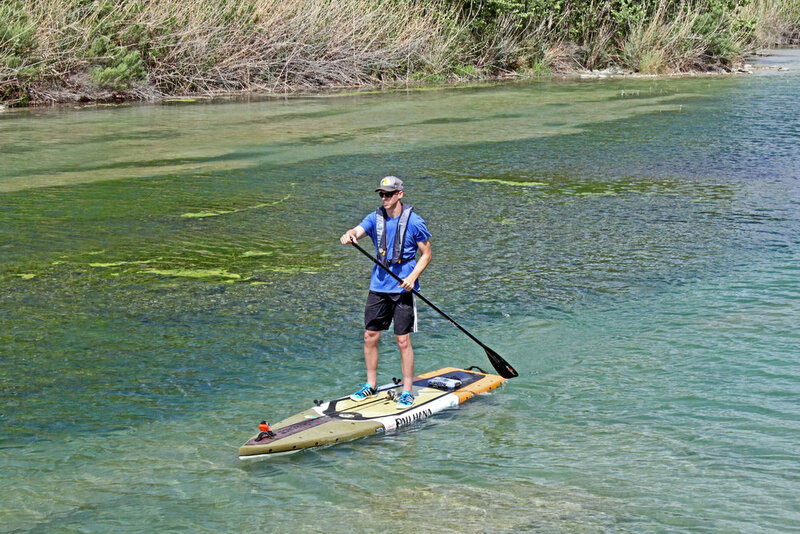 As you might imagine, accessibility to the Devils River is very small and only for experienced paddlers and fisherman. Maybe a better term to express the qualification you need is an adventurer. You will need to be prepared for a wide spectrum of things to happen, because most likely they will. The landscape of the Devils River is very unique, as it lies between three different biotic regions: Chihuahuan Desert, Edwards Plateau, and the Tamaulipan Desert. It is pretty unusual that a pristine river can be running through two deserts, but believe me it is one of the most pristine rivers in Texas. 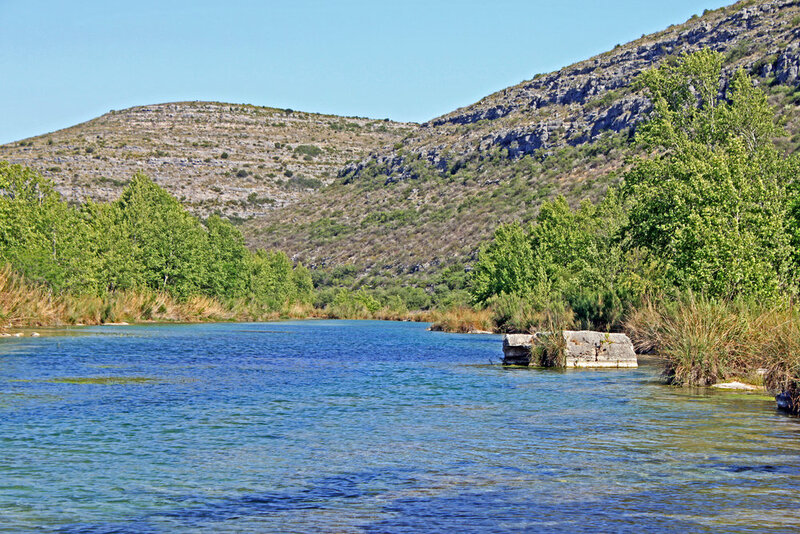 Most of the region surrounding the Devils River is limestone rock, which is one of the main reasons for the quality of water that the Devils River has. The Devils River for the most part is one hundred percent spring fed, but rain does play a contributing factor. The water in the Devils River is extremely clean. It has a slightly green hue to it in areas along with blue tints near some of the springs, but without a doubt it is safe to say that the water is pretty clear. As I stated earlier, the Devils River is almost exclusively spring fed, so it is clean, cool, and filtered by the best filter anyone can ever get...earth. As far as a description of the Devils River goes, I would describe it as a pool and rapid river. Basically, what this means is that there are sections of long pools that are connected by rapids. In some cases these rapids are sufficient to ride, and in other cases it is just a shallow, faster flowing section of water. Sometimes these pools can be extremely shallow as well, but for the most part they are decently deep for a river. The Devils River is carved out of limestone and encompasses a unique riverbed, as channels of limestone are dugout in some areas and not in other areas making an interesting design through the riverbed. Large boulders also extrude the water in many areas allowing for quite a scenic river in conjunction with the water quality. Add in some tall cliffs / mountains, and you have a pristine river in Texas. 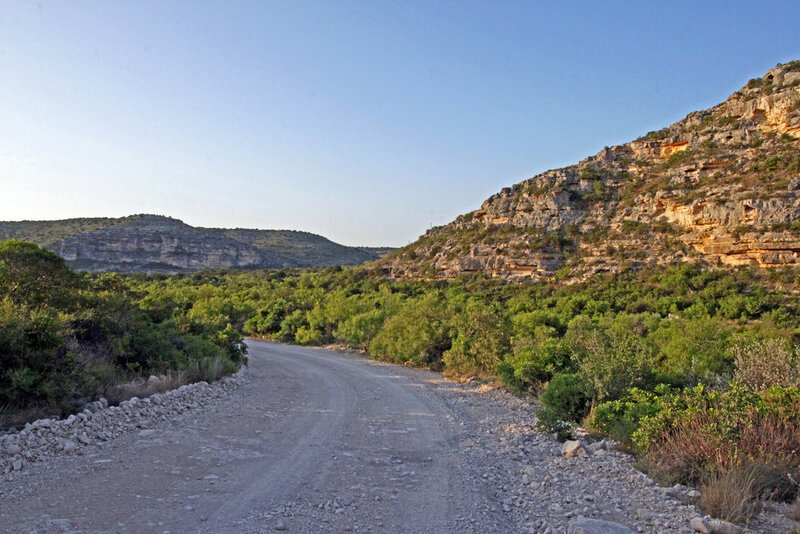 Of course there are trees surrounding the Devils River, but this is not necessarily an easy assumption to make if you are not familiar with the Devils River region, as there are no trees over 6 feet for many miles. 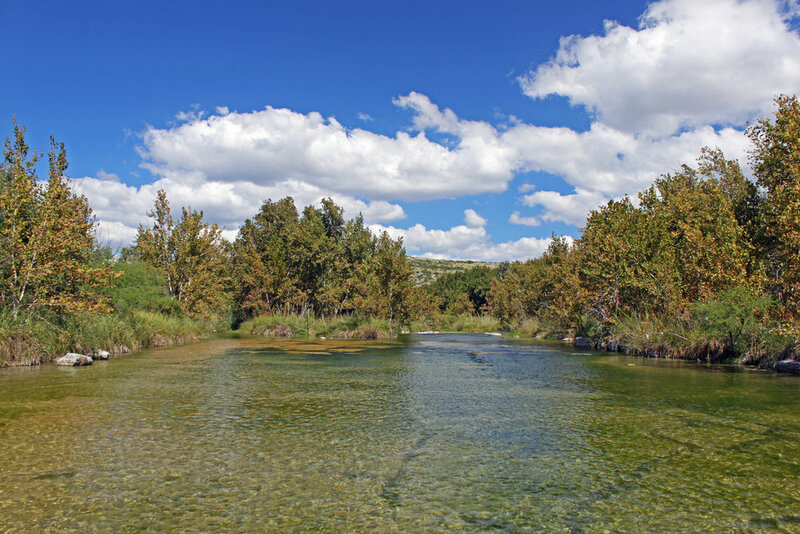 However, the water from the Devils River allows the growth of Live Oak, Pecan, and Sycamore Trees on the river bank. 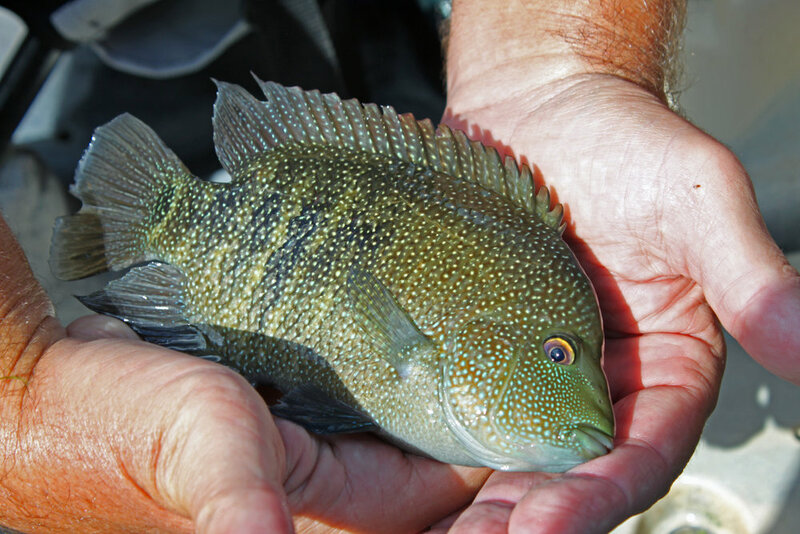 There are a wide variety of fish in the Devils River, with Smallmouth Bass being one of them. This is pretty neat, as this is almost as south as you can go to catch Smallmouth Bass due to the hot temperatures in the southern states. 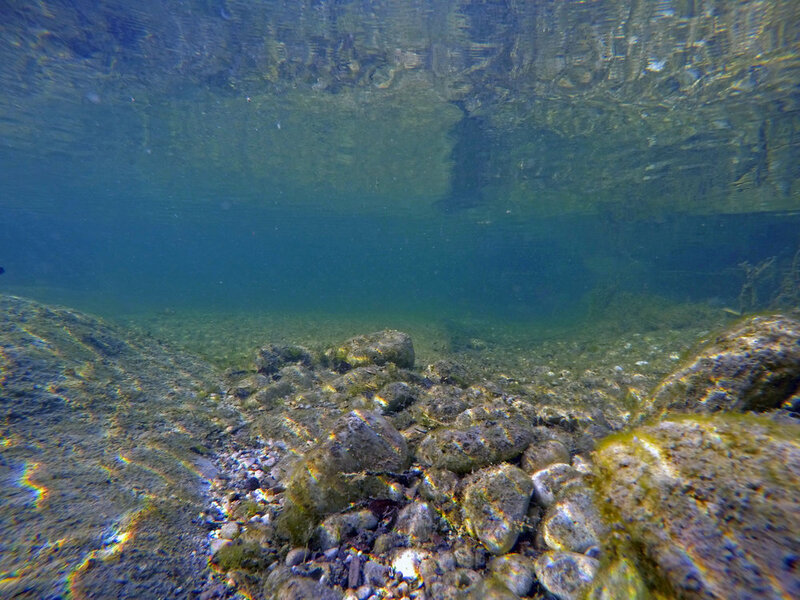 The Devils River has an appropriate temperature for Smallmouth Bass though due to the spring fed water. I like to use the most realistic lures I can, as the water is extremely clear and the fish are quite keen and somewhat skittish. One of my favorite lures is a Rage Tail Space Monkey (in green pumpkin or watermelon red flake) that is Texas rigged weightless. A wacky rig is a great option along with jerkbaits - both hard and soft jerkbaits. Most people overlook jerkbaits, but I have had great success with them. Flukes work well, just make sure you use a semi-translucent color. A Worden's Roostertail is also a great option for areas where there is some current. I like to use a 1/16 oz. Roostertail in Firetiger or Hammered Frog. Crankbaits can be effective, but you will have to find the right size and color combination for that particular day. 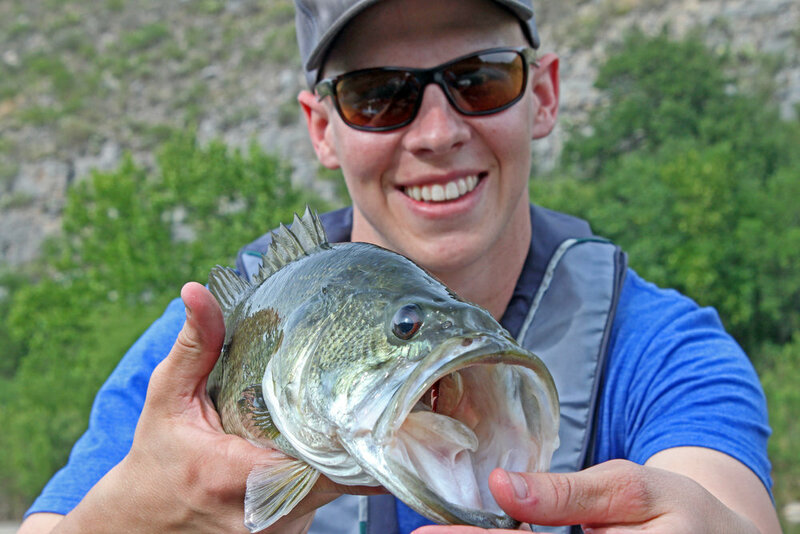 Spinnerbaits are in a similar category - it takes the right conditions for these lures to be effective on the Devils River. For almost any type of water a topwater lure works great, but I would primarily try to throw some topwater early in the morning and late afternoon. A Heddon Zara Spook and some Strike King KVD topwater frogs work great. 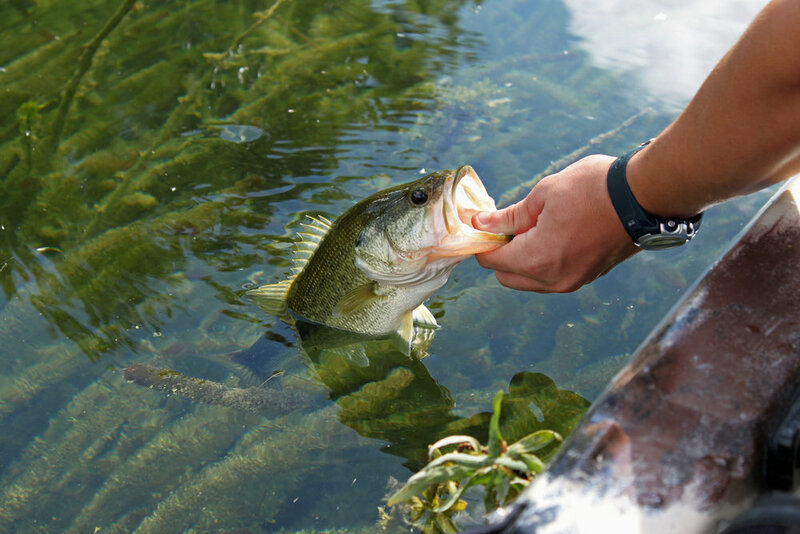 I wouldn’t go to the Devils River without some sort of topwater lure, particularly a frog to throw in areas of vegetation. Many people will recommend fluorocarbon because of the clear water, which is something to consider. Try to use a small diameter line (1o lb. braid works great for me) and maybe a fluorocarbon leader if you can. If you are not a person that likes to use leaders, don’t worry as I have used 10 lb. braid and plain monofilament and had plenty of success. One last tip is to keep your distance and have the sun in front of you. 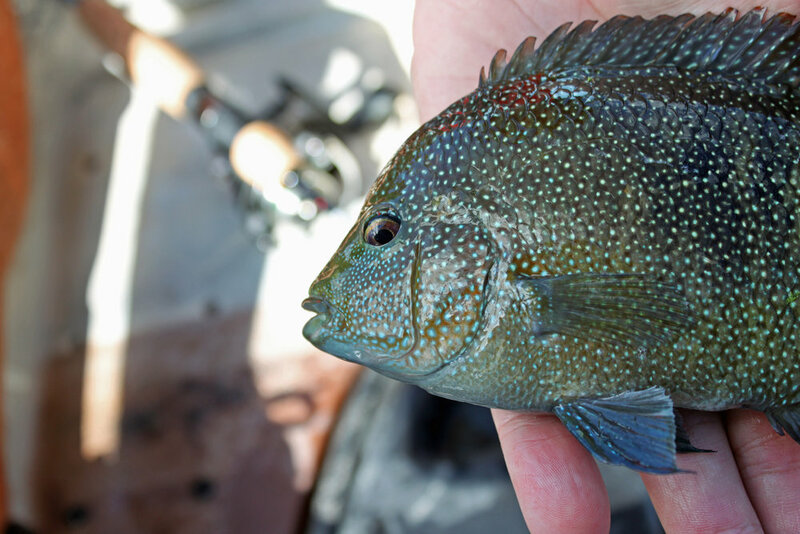 Since the water is clear fish will be more skittish than normal and can see you much easier. Keep your distance from fish. 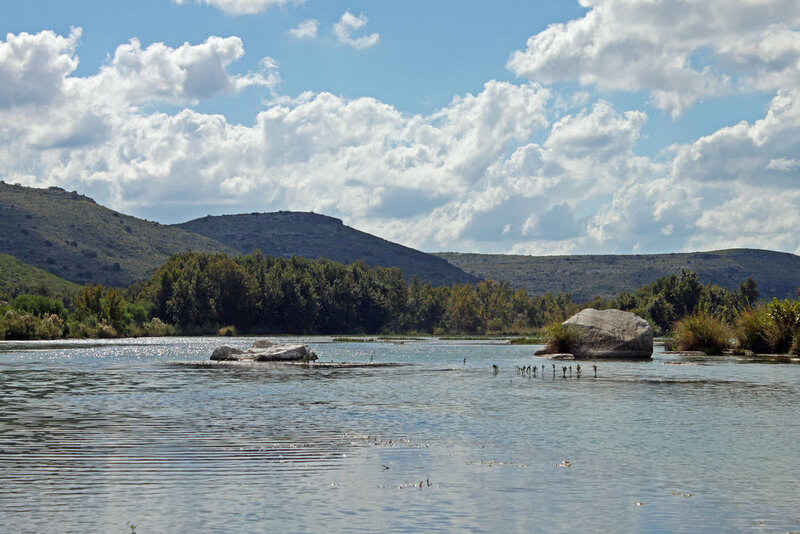 I have links to several articles I have published on the Devils River below. 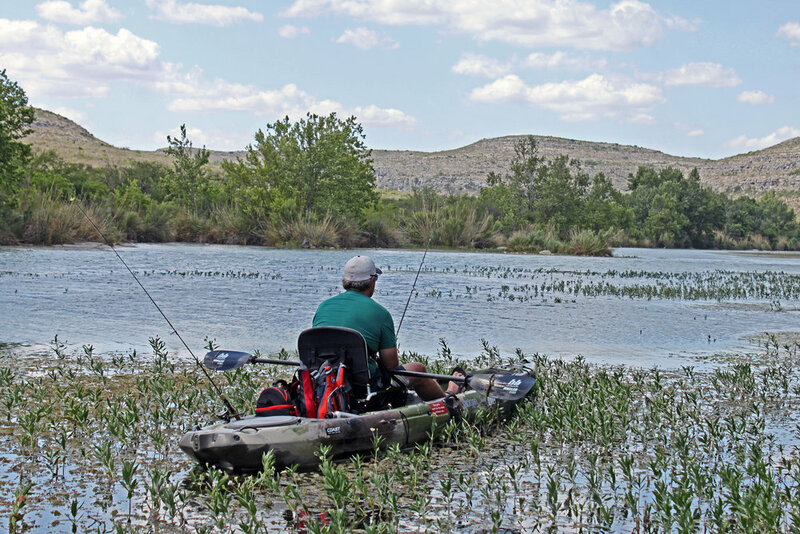 If you are wanting to learn more about the Devils River or would like to read more on some fishing techniques for the Devils River I would suggest taking a look at some of the articles below.